We come to your location, listen to your problems and concerns, educate you on our products and teach you how to decide on the best window tinting solution. We leave samples for you to consider. Measure the glass areas, work up a proposal in our office and email it to you. Give a follow up call for any questions. 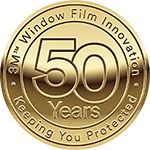 Schedule the window film installation at your convenience. We accept checks, Visa and Master Card.